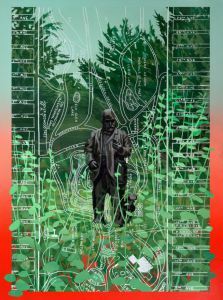 Given that much of my art work takes its inspiration and subject matter from Golden Gate Park, I was eager to read and now share this post by Heath Massey in her “Views from the Thicket” blog. Thanks for this find, Heath! 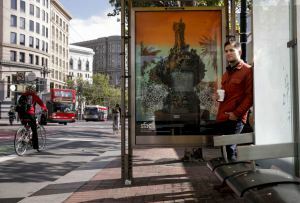 Artist Robert Minervini at a bus stop displaying his artwork “La Poeme de la Vigne (with wine grapes)” on Market Street. 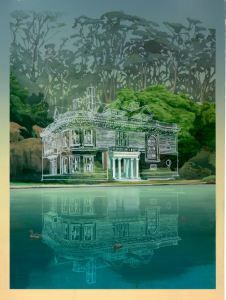 The artist has done six posters about six different monuments in Golden Gate Park, as part of the Art on Market Street series sponsored by the San Francisco Arts Commission. The posters will be on display through May. 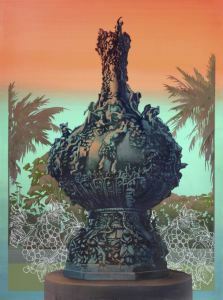 via Painter tells stories behind Golden Gate Park statues – SFGate.